Finally the new Christmas Mugs are here!!! Although they are a month late, 2 of our 4 Christmas colors are here just in time to make Christmas presents. I have a beautiful Plum with a Lilac top and a Forest Green with a Dijon top in a tankard style mug available and ready to ship. All of these mugs are hand thrown by a potter at Deneen Pottery in Minnesota. In a world where all of our manufacturing is outsourced to China, this is a American craftsmanship at it’s absolute finest. These even feel better in your hand then a cheap Chinese mass produced coffee mug. 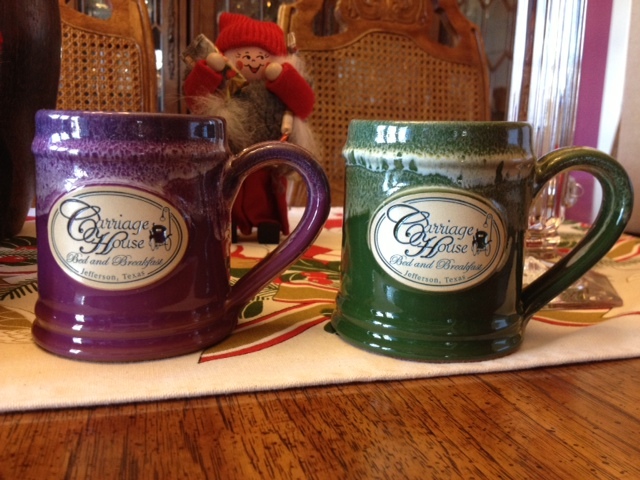 Our coffee mugs sell for $18 a piece ($19.48 w/ tax) plus shipping. Call me at 903-665-9511, if you would like to purchase one. This entry was posted on Monday, December 17th, 2012 at 6:42 am and is filed under Christmas in Jefferson, Jefferson Texas, Specials and Promotions, The Carriage House Bed and Breakfast. You can follow any responses to this entry through the RSS 2.0 feed. You can leave a response, or trackback from your own site.